* How can women forge an identity for themselves against the backdrop of changing definitions of gender and sexuality? * What has psychoanalytic thought to offer understandings of gender development? 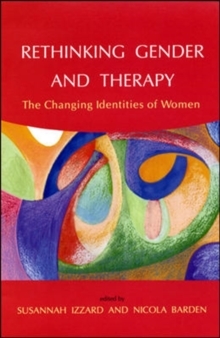 * Can therapists draw upon a fuller picture of women's internal and external influences?Rethinking Gender and Therapy brings together the contributions of psychoanalytic theory and sociological analysis to explore the interrelationship between the inner and outer worlds which impact on a woman's identity. How a woman's experience is depicted by and perceived by the society of which she is a part profoundly affects how she experiences herself. This book seeks to explore that dynamic in relation to key life stages (such as infancy, adolescence and older age) and in terms of key issues such as relationships, work and family. Rethinking Gender and Therapy moves beyond those past divisions between psychotherapy and sociological, gender and cultural studies that have fractured our understanding of the development of a personal gender identity. Moreover, it helps therapists in their practices to draw upon a well-rounded and deeper analysis of women's inner and outer worlds. This book is an important resource for all trainee and practising therapists and counsellors, for all students of gender, women's studies, counselling psychology, and psychotherapy, and for those involved in helping women across the caring professions.